Cheers! Enjoying Surinamese Rum on the boat back to Paramaribo on the Sugar Trail. The former Dutch colony of Suriname is famous for its sugar cane plantations. 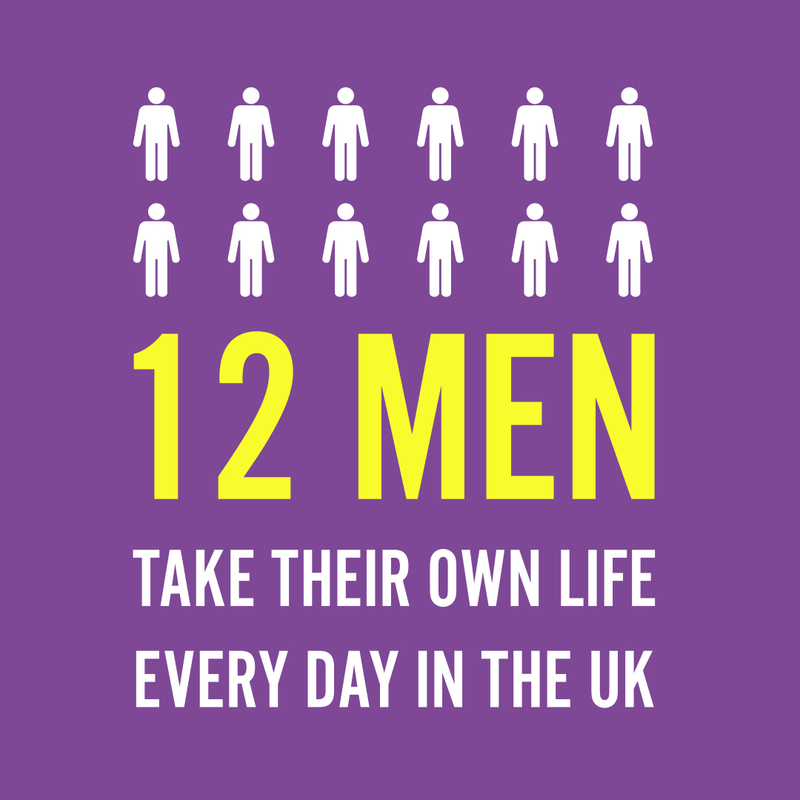 These days though it’s a thing of the past. 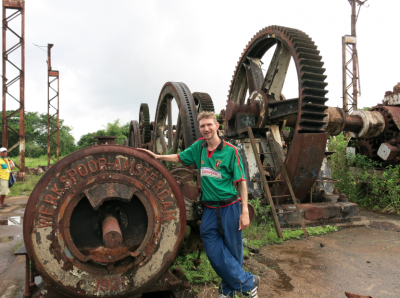 The glory days of sugar cane plantations may have gone here in Suriname, but as a keen backpacker you’ll want to read up on your Surinamese history and discover what all the fuss was about. The best way to do this is go there yourself and get booked onto a Sugar Trail Tour, which we did of course! 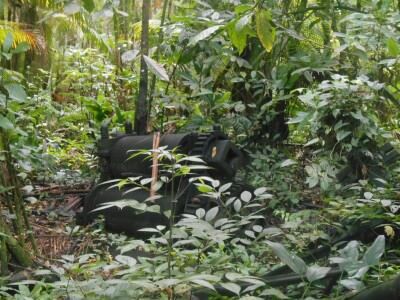 I will also point out that aside from sugar cane, in general there were a lot of different kind of plantations that flourished in different times in Suriname. So not only sugar. (Also cotton, coffee, cocoa etc) But in a certain period, sugar was the main thing. When the sugar beetroot was discovered in Europe this changed things a lot. Sugar Cane Plantations in Suriname – cool tour! 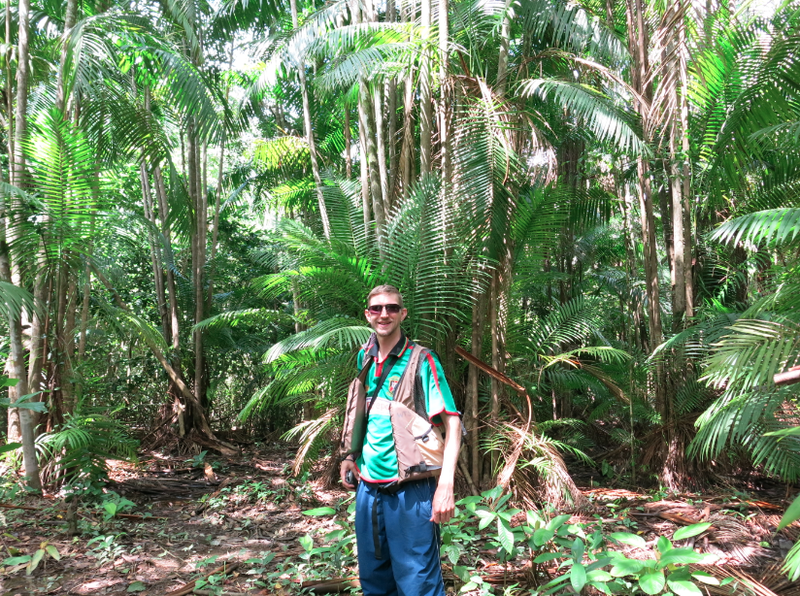 I recommend basing yourself in Paramaribo. It’s the capital city and it’s where all the main companies are based. 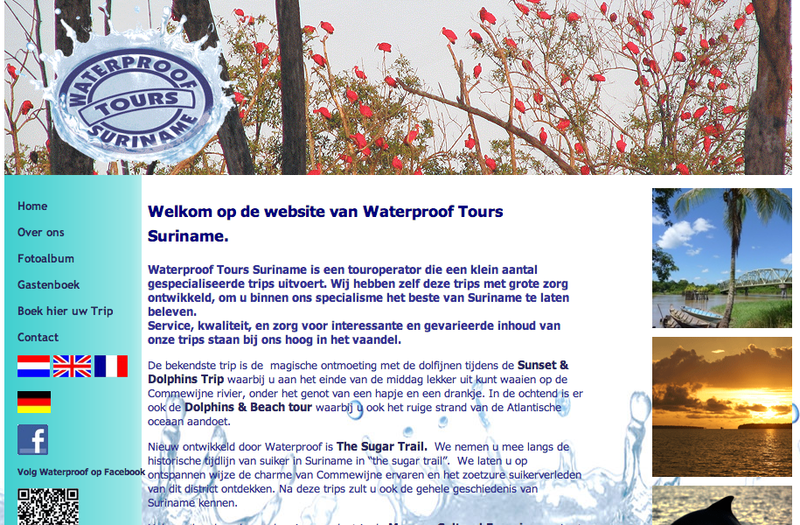 To book a sugar cane tour use Waterproof Suriname and they also have their website in English. They are experts in organising tours around Suriname and the Sugar Cane Trail comes highly recommended. You can book your tour by email, by phone or call into the office in person. 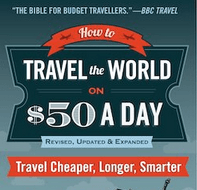 The cost can vary of course, but as of July 2014 is 65 Euros per person. 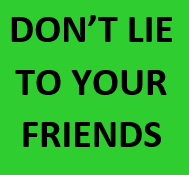 Payment can be in Surinamese Dollars, Euros, US Dollars or PayPal. We were asked to meet at 8.30am at the reception of Hotel Krasnopolsky in central Paramaribo – it’s on Domineestraat. We were greeted by our guide for the day. 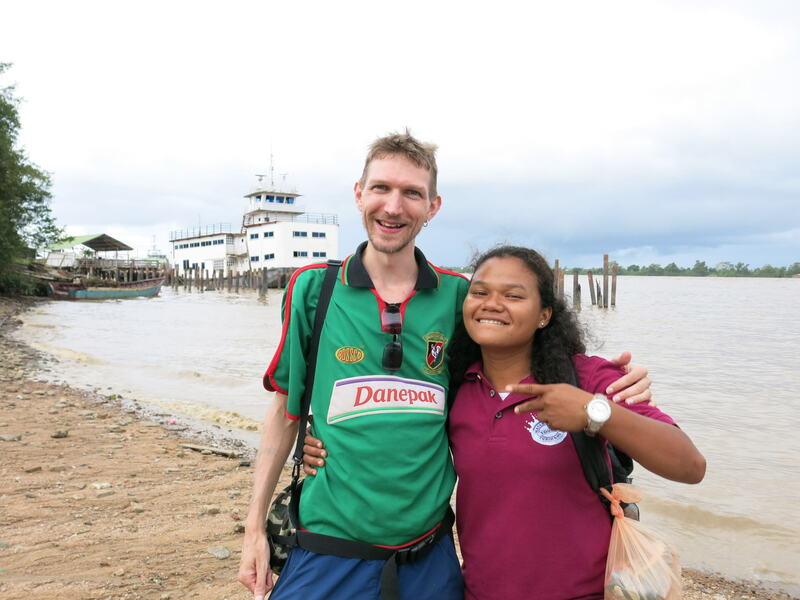 Her name is Njoek and she is local therefore her main language is Dutch. The tour will be conducted in both Dutch and English. 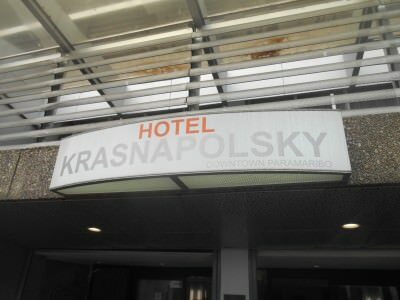 Hotel Krasnapolsky – meeting place for the tour. We board our mini-bus and it’s just Panny and I with a lot of Dutch tourists. 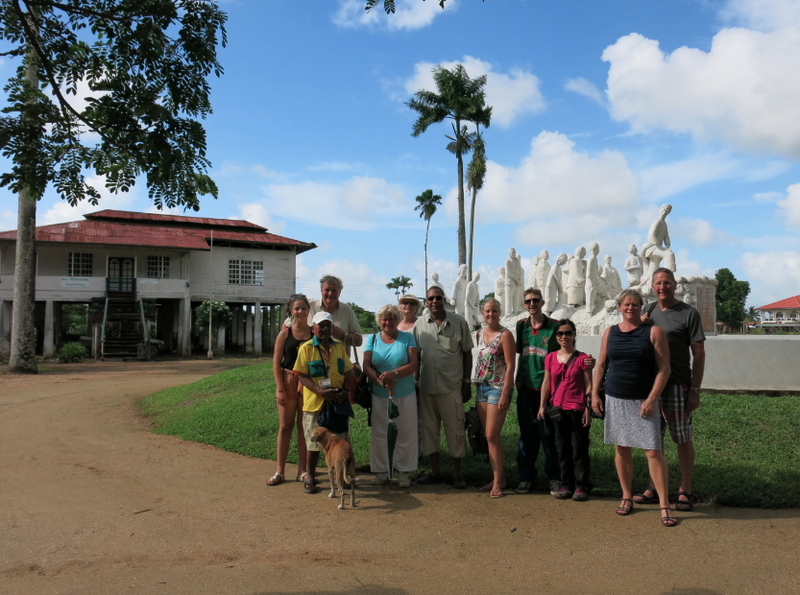 Understandably most of Suriname’s tourists tend to be Dutch! 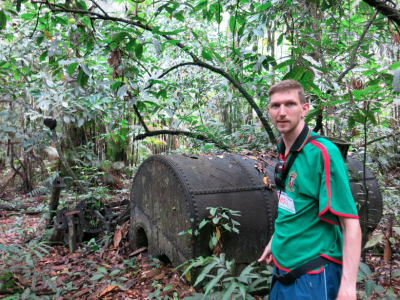 We leave behind Paramaribo and are given a full introduction from Njoek, with expert quirky facts during the journey, including pointing out “hammock” street, the sunken German war ship in the Suriname River and lots of details about Surinamese history. It’s completely informative and fascinating. 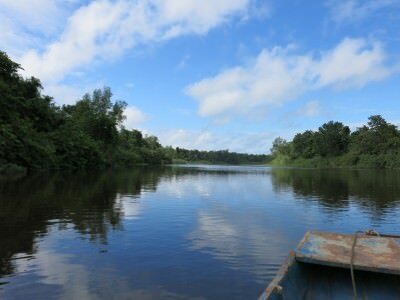 Suriname is not a common backpacking destination and you’ll really enjoy it. 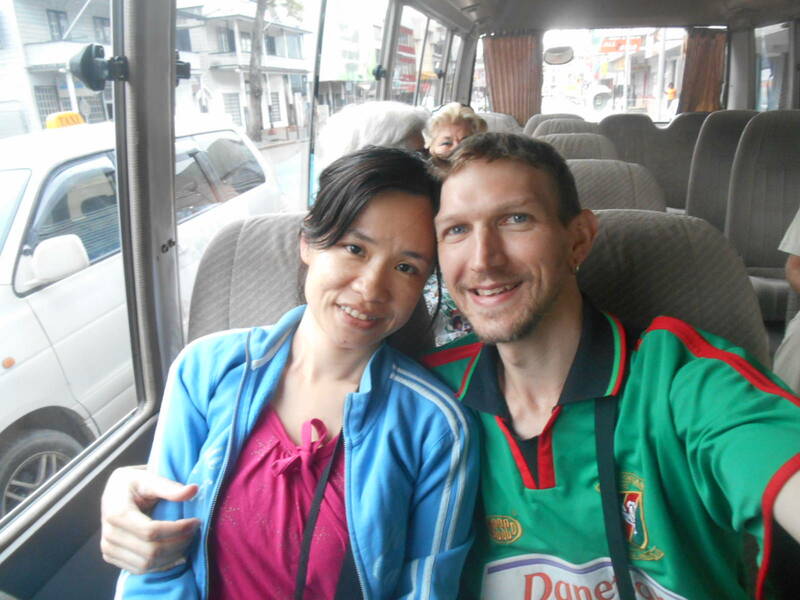 On the bus to the Concordia Plantations. 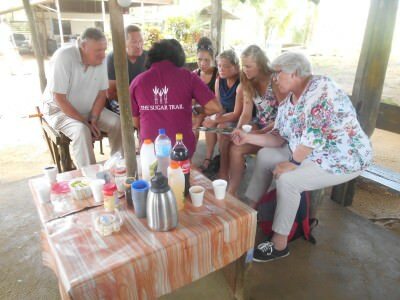 In our minibus, we cross the bridge over to New Amsterdam and on route to the plantations at Concordia we are also given a soft drink. I choose a white drink called Surinamese Soursop Juice. Nice start to the tour. 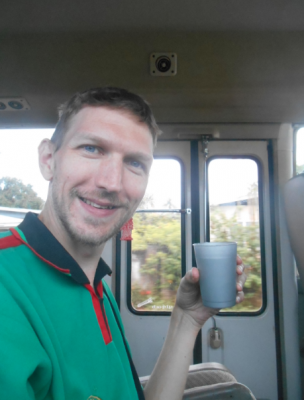 Enjoying my Suriname Soursop Juice on the bus. On arrival at this village on the other side of a bridge, it’s morning coffee and biscuits time. We have a choice of tea or coffee and snack on some biscuits. We are given a short introduction about Concordia and where we are heading next. We put our lifejackets on and board the boat. Coffee time before heading to Concordia Plantations. 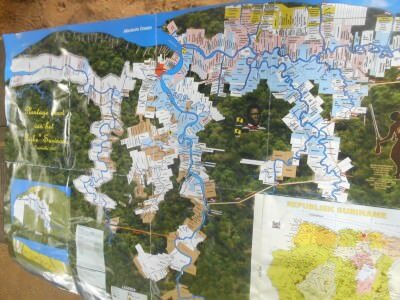 A cool map Njoek showed us of the Sugar Cane Plantations in Suriname. 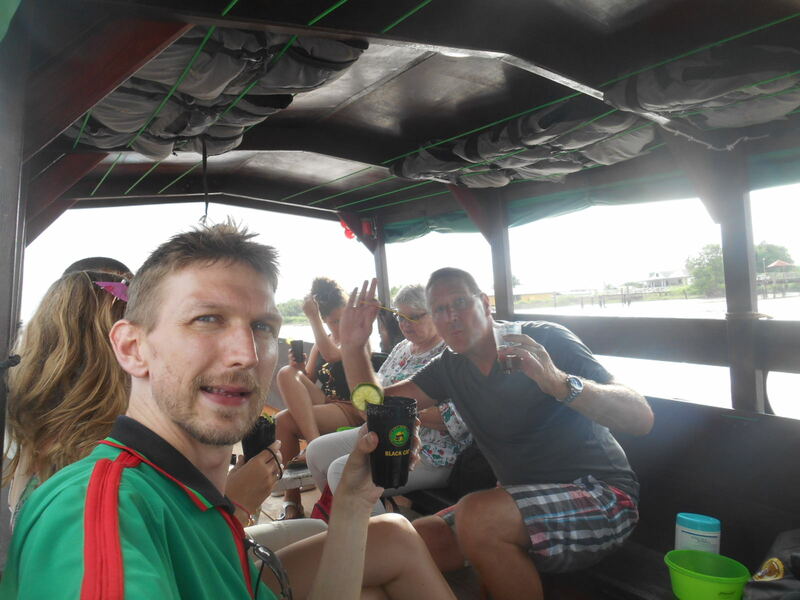 We all board a speedboat to take us along the Commewijne River. It’s a really cool and relaxing journey. We are given a bottle of water each. The sea spray cools us down a notch. Bring some sun cream and insect repellent here. On the boat on the Commewijne River to Concordia Plantations. 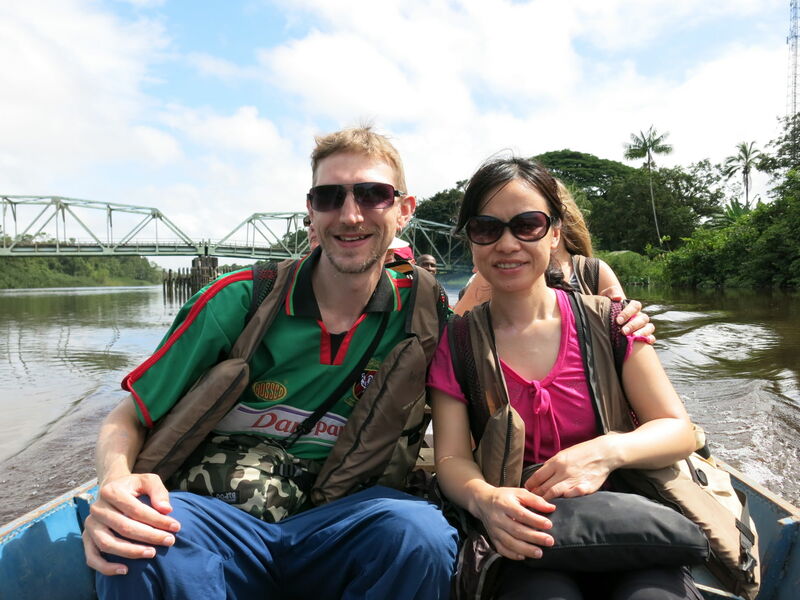 Njoek our guide gives us more anecdotes and stories along the way as we arrive in a custom made jetty in the middle of the jungle. This is the Concordia Plantations. 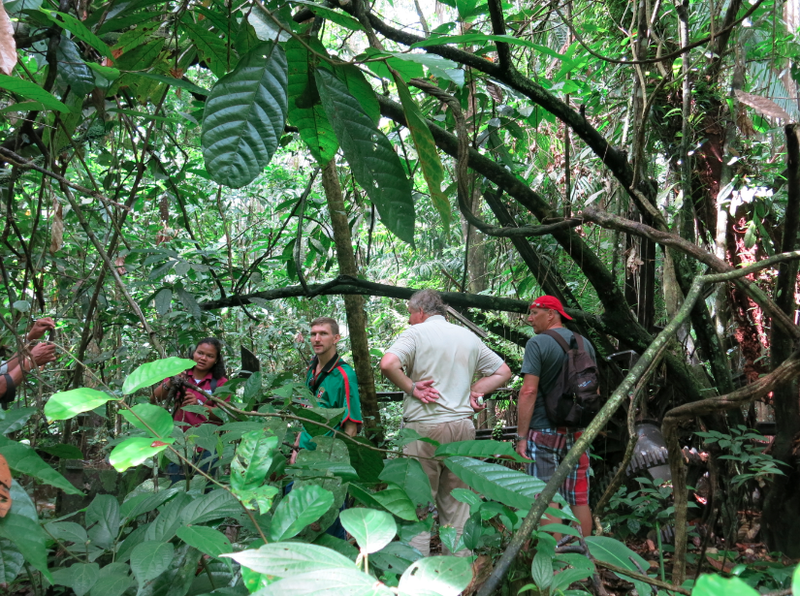 Arrival in the jungle at Concordia Plantation. 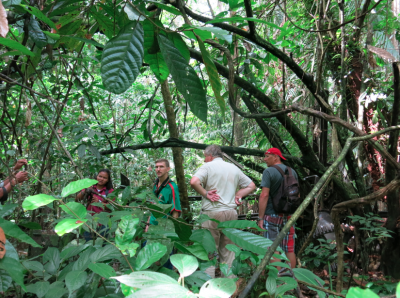 This is a fascinating walk through the jungle at the Concordia Plantations. 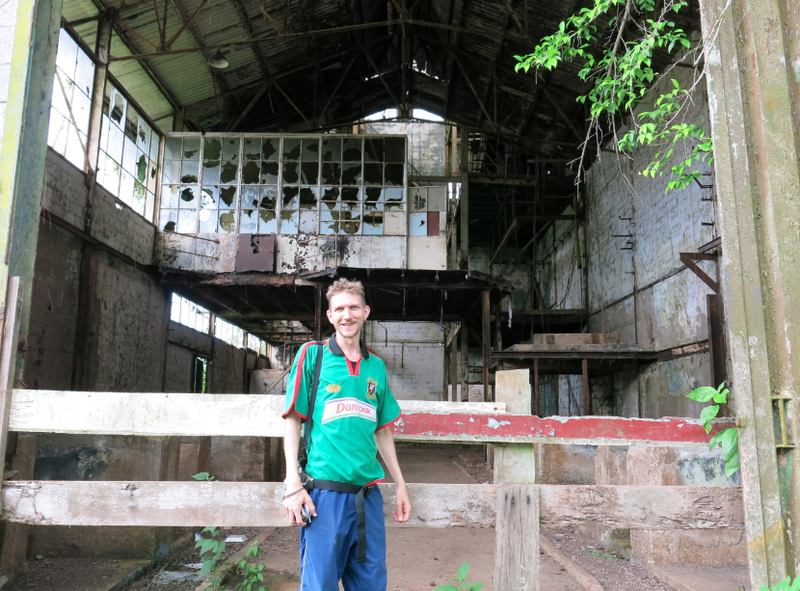 After the sugar cane industry died in Suriname, this place is no longer in use, the glory days were from the late 1880s to the latter part of the 20th Century. My first quick tip is to make sure you bring your insect repellent – we sprayed a lot on but still picked up some bites – spiders, mosquitoes and ants are quite common in this part of the jungle. 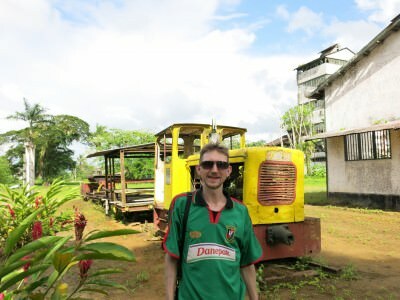 Touring the Concordia Plantations in Suriname. First of all we are shown some trees which bear fruit. 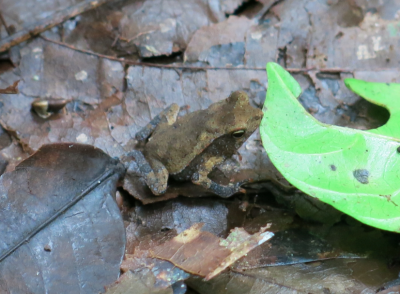 Then we hear some howler monkeys, but we do not see them. 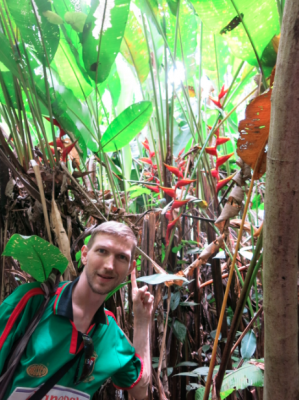 There are lots of unusual plants and trees, at least for me, including “the parrot plant” which when you move it up and down squawks like a parrot! 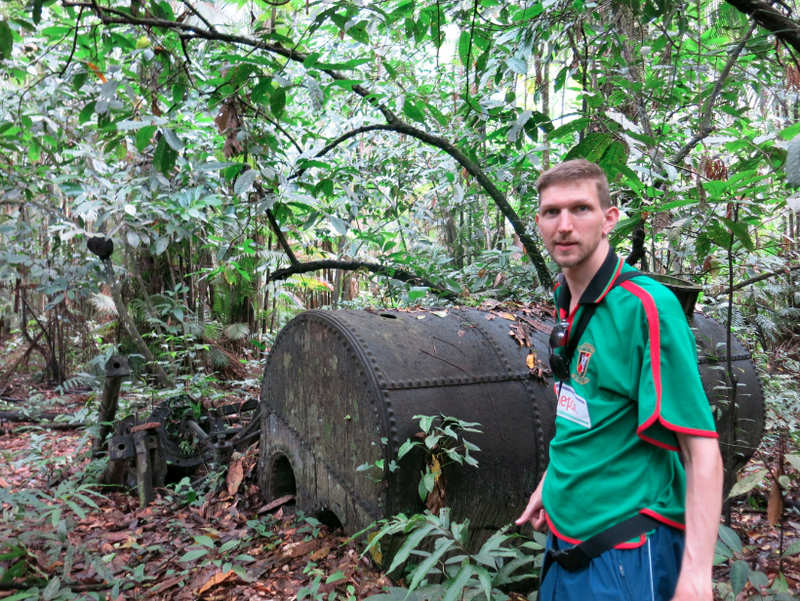 The walk through the jungle leads us to some mills and abandoned engines. 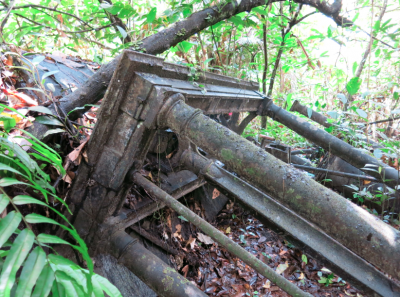 Here in the middle of a forested jungle sit some remains of old mills and engines that were used in the harvesting and refining process for sugar cane. 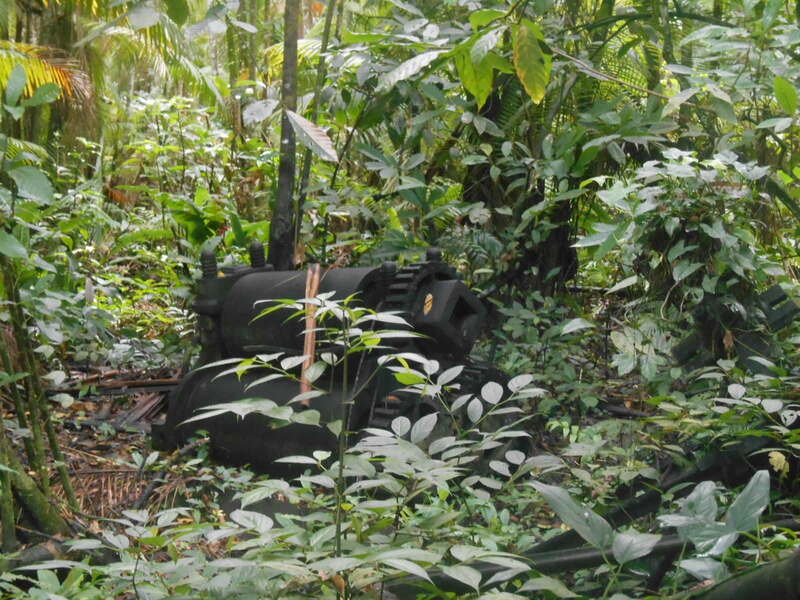 Ruins of the old mills in the jungle. We board the boat back from Concordia and are given some of the local snack Borrell Chips to share on the journey. We see some odd looking animals including one pictured below called a Capybara. 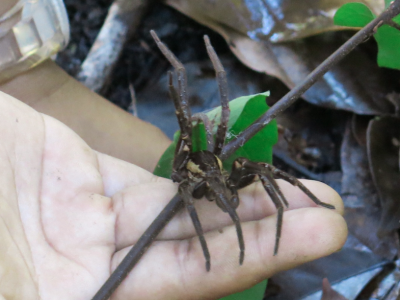 These were in cages at the base before getting the minibus to Tamanredjo. There was also a baby jaguar there. 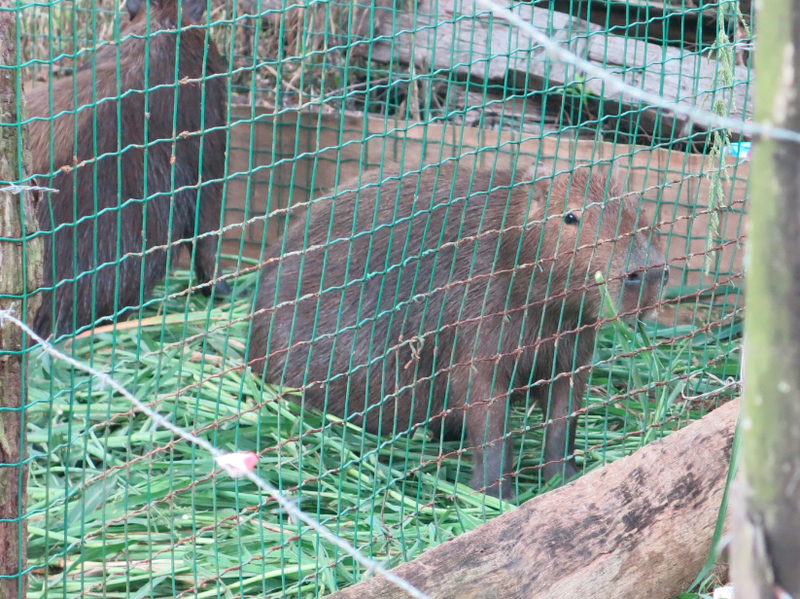 An unusual animal called a Capybara, which we saw at Concordia. After Concordia we drive to Tamanredjo where we stop on the main road for lunch. The restaurant for lunch is a typical Javanese style cuisine – roots from Indonesia of course. 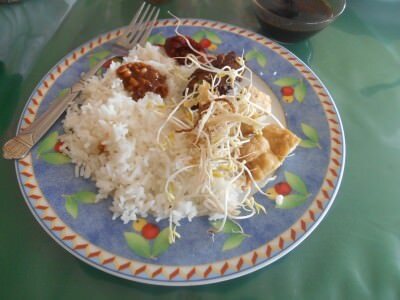 We have a choice of lunch and we choose a tofu, chicken and vegetable meal plus a chicken and rice meal. We drink Coca Cola. It’s all included in the tour cost. For extra you can have an alcoholic drink or some chicken satay sticks. Lunch at Warung Toucha restaurant in Tamanredjo. 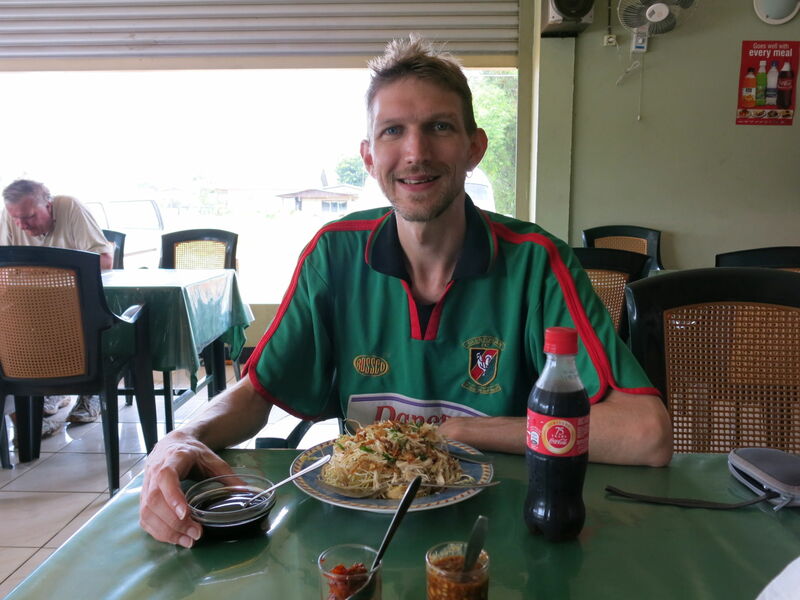 The restaurant was called Warung Toucha. We have a short drive through the countryside to arrive at the village of Marienburg. On route again Njoek gives us lots of information about the area, the sugar plantations and the housing style and current vegetation and agriculture. 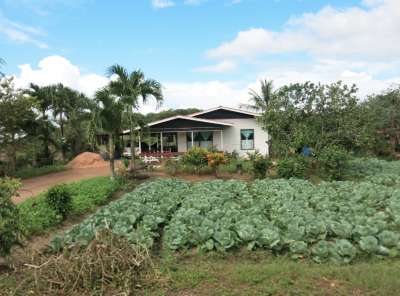 Most houses along the way grwo their own vegetables and fruit. A house on the way to Marienburg. Marienburg is almost like a custom built village just for the sugar cane plantations. And that’s basically what it was. 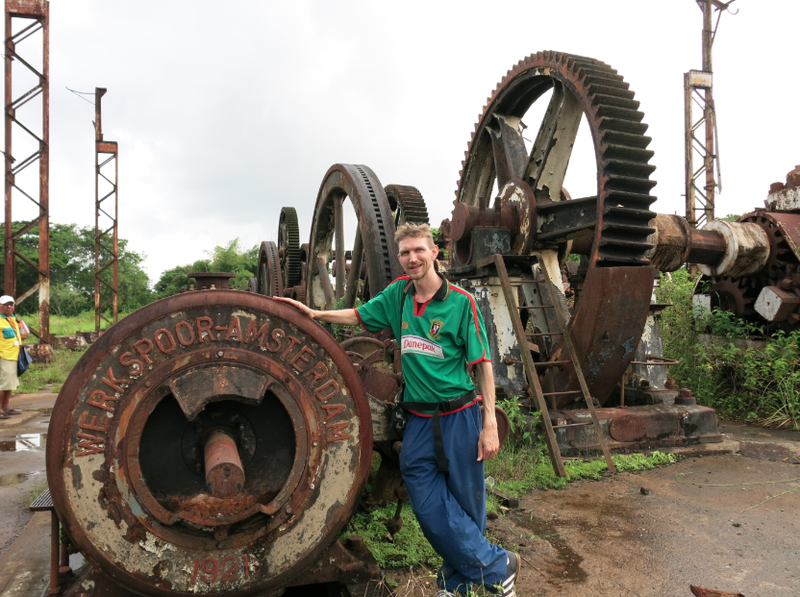 It’s a bit sad that trade has died away here – the last sugar cane was refined in Suriname in 1998 and Marienburg itself closed in 1986. Now Marienburg serves as a museum and a glimpse of the past. Here are some photos I took, which also includes the only train line that Suriname ever had. For the transport of Sugar Cane of course! Our tour group at Marienburg. In front of the train which once transported sugar on Suriname’s only railway. We have a quick stop in New Amsterdam and see a war memorial by the river before it’s time for the grand finale – a boat trip back to Paramaribo. We leave our driver here. 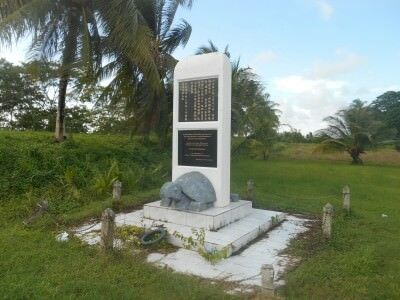 Memorial in Chinese at New Amsterdam harbour. 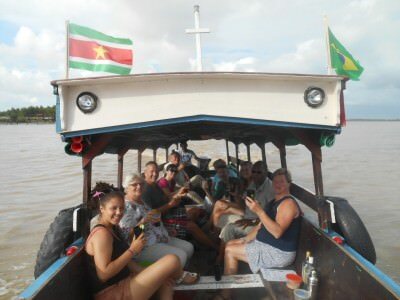 The Party Boat Back to Paramaribo! Yes so at New Amsterdam just before the sun is setting we board a boat back across the Suriname River to Paramaribo. It’s a journey to remember. 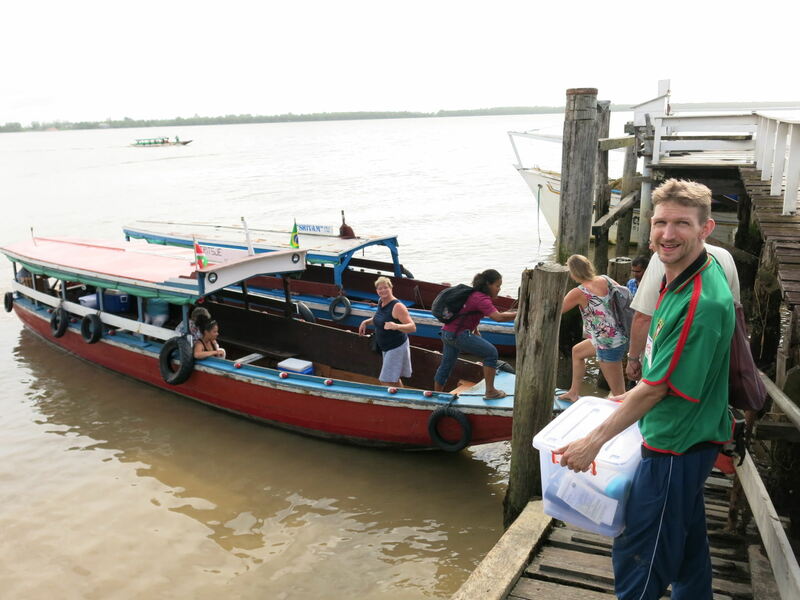 Boarding the party boat back to Paramaribo! The cocktail menu on the party boat. Njoek dishes out some local snacks including Borrell Chips and grapefruit. Then she hands out a drinks menu! 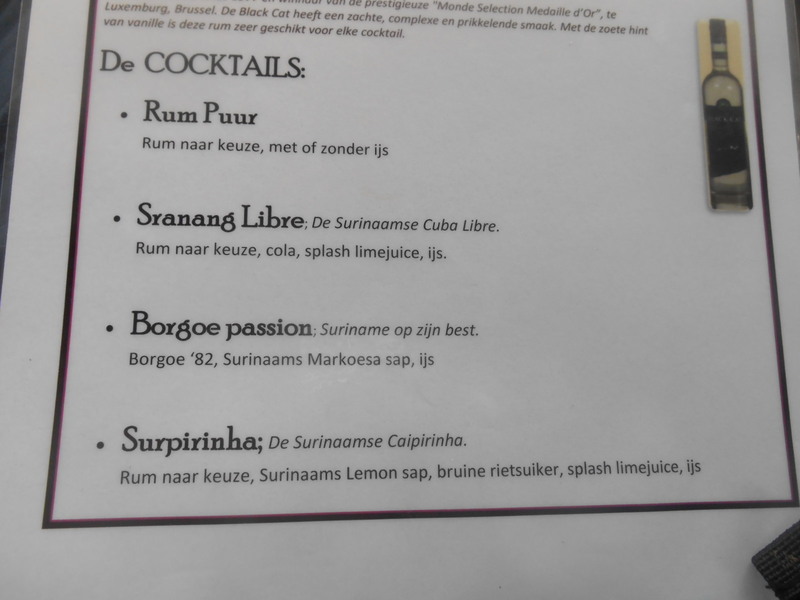 There are four choices of drinks all including and made with the Surinamese Rum! Despite having been to Suriname in 2011, I never tried the local rum before so this was a first for me. 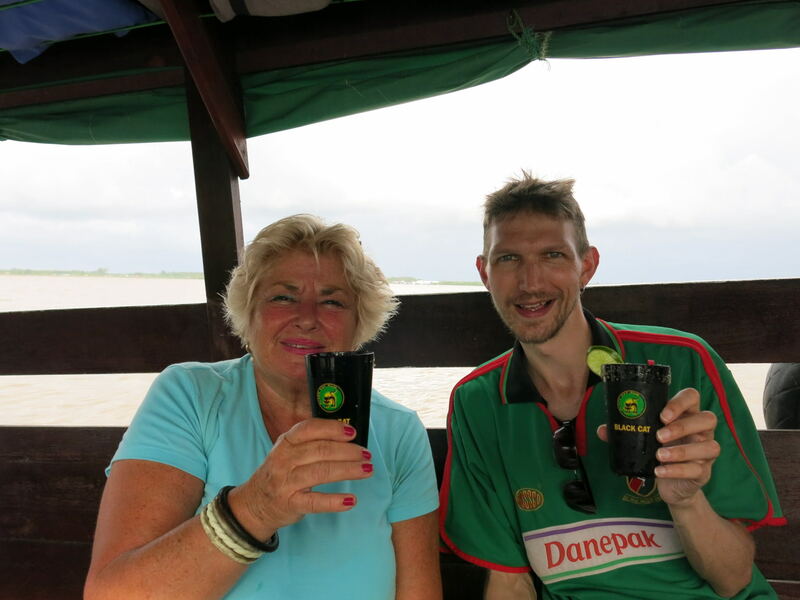 Drinks for sunset on the party boat back to Paramaribo. 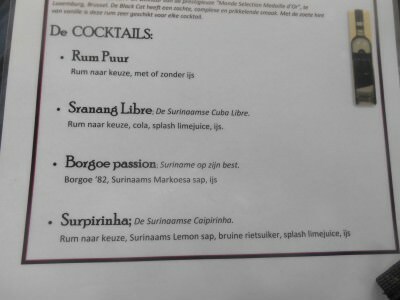 I opt for the Surprinha, a cocktail made with lime and Surinamese Rum. We all raise a toast as the sun sets we sail back to the capital city. It is truly inspired. With Maud from Netherlands and our Surprinha Cocktails! We say our goodbyes on arrival back into Paramaribo and as the sun sinks, I bid a fond farewell to the capital city again. 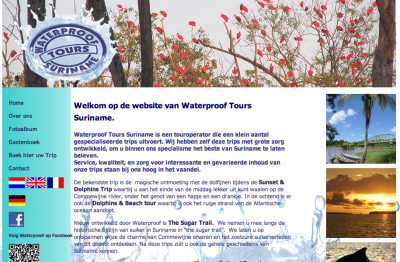 I highly recommend hooking up with Waterproof Tours in Suriname. They also do some awesome river tours and dolphin watching. 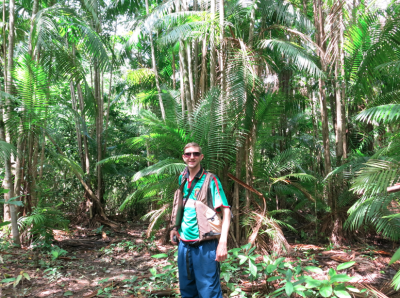 Fond farewells to Njoek our guide for the day! 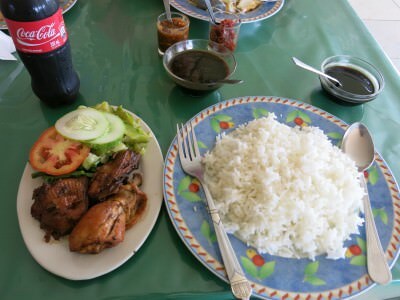 This entry was posted in Concordia, Destinations, Marienburg, New Amsterdam, Paramaribo, South America, Suriname. Bookmark the permalink.